Supplementary material reads: "A. 4 shots, 1 & 2: Christine Cook, Barbara Elmore, Jack Elmore, Bill Rongey of the Heartland Hoedowners, children's square dance group from La Mesa, get ready for the children's Cavalcade to be held in Balboa Park, San Diego on July 29 and 31st. With over 400 children participating, the Children's Cavalcade is sponsored by the San Diego Park and Recreation Department in cooperation with the Fiesta del Pacifico. B. 2 shots, 3 &4: bertha Fisher and Jimmy Maczko, two of the youngsters taking part in the Modern Square Dancers section of the Children's Cavalcade rehearse for their performances on July 29 and 31st in Balboa Park, San Diego. Berthy and Jimmy are members of the Rainbow Twirlers, square dance group from Lemon Grove. The Children's Cavalcade is sponsored by the San Diego Park & Recreation Department in cooperation with San Diego's annual Fiesta del Pacifico. C. Fifteen years old Marilyn Schowengerdt dances the Spanish Princess in San Diego's Junior Civic Ballet performance of 'The Golden Pitcher' from the series 'Castles in Spain'. The Junior Civic Ballet, scheduled for August 5th and 7th in Balboa Park, San Diego, is sponsored by the San Diego Park and Recreation Department in cooperation with the Annual Fiesta del Pacifico. D. Line shot of dancers: Sixteen year old Pam Peterson demonstrates a step to youngsters dancing in the Junior Civic Ballet, one of the many events scheduled for the 1957 Fiesta del Pacifico. The Junior Civic Ballet danced by children of all ages will be seen on August 5 and 7th in Balboa Park, San Diego. 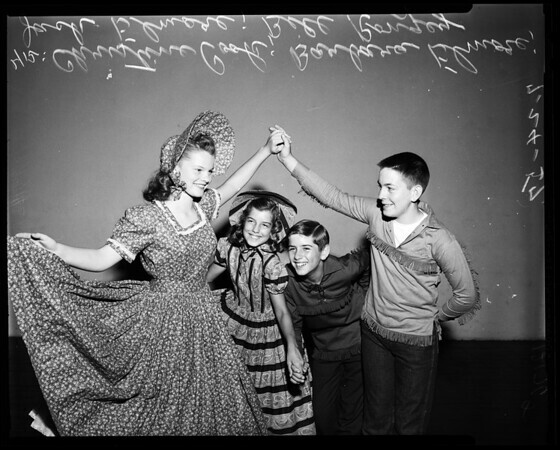 Mrs. Maria Field, ing, Supervisor of Social Recreation for the San Diego Park and Recreation Department was choreographer for the ballet with a Spanish theme. Young dancers aged twelve to seventeen will dance 'The Golden Pitcher' from the series 'Castles in Spain' by Bertha L. Gunberman."